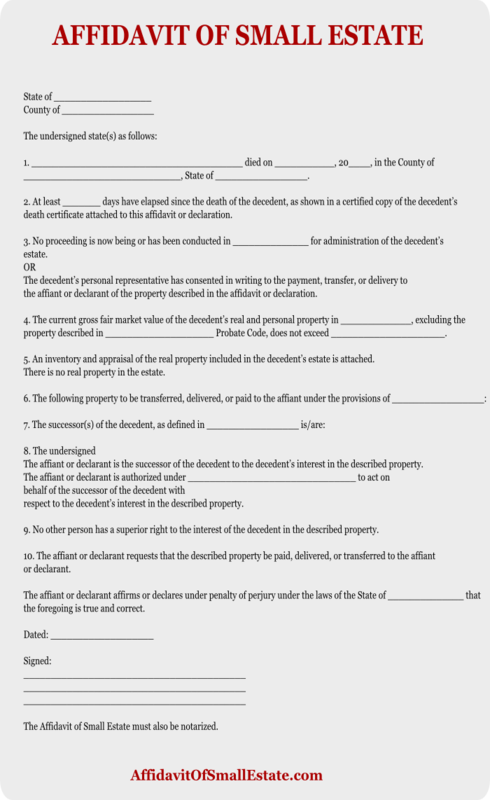 Build your own free Small Estate Affidavit form personalized with your own state, county or parish information. Do it yourself and save money with our free Small Estate Affidavit form. It takes only 5 minutes to fill out and the form is completely online. A Small Estate Affidavit is a sworn statement signed under oath by an heir or heirs of an estate that the estate’s value is worth an amount small enough to avoid or shorten probate. Depending on the size of the estate and the state where you reside, you may qualify for an uncomplicated procedure for heirs of small estates. This procedure involves the use of a Small Estate Affidavit. Small Estate laws allow heirs the right to receive property without the long process of probate. In many states, heirs can shorten or avoid probate. A Small Estate Affidavit is especially useful for quick access to bank accounts and market securities. Your free Small Estate Affidavit form should be prepared by the executor of the will or the person with the most knowledge of the deceased’s assets. If the Decedent dies without a will, then the spouse and heirs must prepare the Affidavit. Feel free to download a free Small Estate Affidavit form above. It is a generic form that can be tailored to fit your needs. property described in ____________________ Probate Code, does not exceed _____________________. 5. An inventory and appraisal of the real property included in the decedent’s estate is attached. There is no real property in the estate. The affiant or declarant is the successor of the decedent to the decedent’s interest in the described property. respect to the decedent’s interest in the described property.